Displaying 1 - 60 of 72 items found. Combine bright tone-on-tone prints with black multicolored prints to create a quilt with a definite Amish Flair. Quilt Size: 60" x 60". Bargello is one of the most versatile and easy strip-piecing techniques that you can experience. Valance Size: Any size. Try a simple technique with a common household item to create perfectly pieced circular designs. 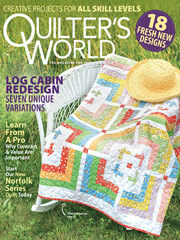 This e-pattern originated in Quilter's World June 2008. The model shown for this design is a beautiful, pieced top that gives a wonderful history of fabrics from the latter part of the 19th century. It was hand-stitched and hand-pieced. This e-pattern was originally published in Quick & Easy Quilts. Size: 72" x 77". Unit Size: 7" x 6", 7" x 12". Quilt Size: 56" x 84"; Pieced Log Cabin design. Using acrylic templates and a rotary cutter makes cutting the curves used in the Drunkard's Path quilt a cinch. Project Size: 72" x 84". The Eight-Pointed Star design is one of hte most popular and basic Nine-Patch patterns. There are countless variations from simple to complex. This antique scrap version has an unusual setting. Each block combines only two fabrics, a light and a dark value. The blocks are set together with wide sashing strips on the diagonal without borders. If you like the antique look, antique reproduction fabrics may be found at your local quilt shop. Finished Quilt Size: 63 3/4" x 80 3/4". Block Size: 9" x 9". Your baby will have sweet dreams snuggled under this simple, flannel pinwheel-design quilt. Size: 41 1/2" x 52". Gradations of blue are featured in this pieced throw, but you may successfully use shades of your favorite color to coordinate with your decor. This e-pattern was originally published in A Rainbow of Quilts. Size: 55" x 71". Block Size: 12" x 16". Use drapery fabric to piece a pillow for a decorating accent in your home. Add a few embellishments to make a one-of-a-kind pillow. Pillow Size: 12" x 12". The quilting lines create the appearance of seams where there are none in this easy lap-size quilt. Size: 44" x 60". Embroidered snowflakes create a puffy design in the background of this redwork Santa. This e-pattern was originally published in Quilt a Colorful Christmas. Strip-piecing the Nine-Patch blocks for this quilt is easy. Putting them together to make the ringed design will prove to be an enjoyable challenge for the experienced quiltmaker! This e-pattern was originally published in Inspiration for Precuts. Size: Approximately 69 1/2" x 90". Block Size: 3" x 3". Just like grandma used to make! Finished quilt size is 81" x 93". Block size is 9" x 9". Right about now you need something bright to light up your kitchen after the long, dark winter. Quilt Size: 13" x 15"; Towel Size: 19" x 29"; Napkin Size: 18" x 18"; Place Mat Size: 13" x 18". Try folded fabric squares to create three-dimensional boxes. Finished quilt size is 45" x 63". Block size is 9" x 9".